Probably a first on the boys side, and for sure at 18U, this past weekend we had both boys 18U Black and 18u Red in tier one in Welland. The teams met in quarters with the jersey decision going to Red who wore black jerseys for the classic Red vs. Black matchup. 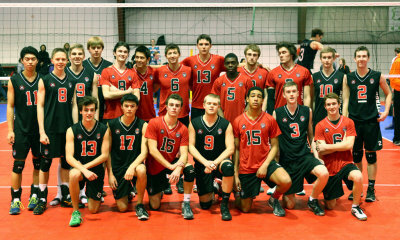 18U Black, arguably the best team in the province, prevailed in three. 18u Red played a great tournament, taking each of the five tier 1 teams they played to tiebreaker’s, but lost a heartbreaker 15-17 in their last match so will spend their next 18u tournament climbing back up to tier one for Provincials. The boys side of our club is getting stronger each season, with multiple teams now at most levels. Go DA!